Both sides form a guard of honour as Luke Power triple premiership and 300 game player is carried off by his GWS team mates. The siren sounds and the Demons have a won a scrappy game, however, they looked anything but dominating and the Giants despite trailing by 45 points came home with a wet sail to lose by 25. GOAL GIANTSGreene is resting in the goal square, he is giving up 12 cm's to Watts and yet he still out positions the Melbourne defender and kicks the ball over his head for a goal. GOAL GIANTSTwo in a row for the GWS as Greene, who has racked up 37 possessions, hits Smith with a well weighted hand pass. Smith then proceeds to drill snap. GOAL GIANTSMcDonald shows his former team mates that he still has a little left in the tank as he works the give and go and kicks the goal. GOAL DEMONSMelbourne work the overlap to perfection as Sylvia draws the defender and then passes off to Grimes who strolls into the undefended goal. 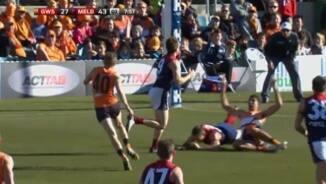 BEHIND DEMONSJones almost has his head ripped off in the tackle and is awarded the free kick, from 48 out he too has trouble judging the wind and the Dees add yet another point to their total. The game has slowed to a crawl as both sides look towards the final siren, it never reached any great heights and from the looks of the last quarter it isn't going too. Buntine was over the line as he kicked out and so we'll see a ball up on the tip of the goal square, another rudimentary mistake from the league's newbies. BEHIND DEMONSGreen kicks Melbourne's 17th behind of the match both sides have really struggled to kick accurately in this wind. BEHIND DEMONSBail marks in space and after taking a second to adjust to the wind has a shot on goal from 45 out, the kick is close...hits the post, one behind. Almost half way through the final term and Folau has just picked up his first kick of the match, to go along with a pair of hand passes, the Bronx cheers ring out around the ground. BEHIND DEMONSOn the burst Sylvia decides to have long shot from 55 out, although kicking with the wind he struggles with the distance and sprays it across the face for a minor score. GOAL GIANTSPhillips standing tall marks 20 out right in front, he turns and goals. The Giants are on a roll that is two in a row. SUBSTITUTION GWSClifton comes on as Hoskin-Elliot come off. GOAL GIANTSDavis charges forward from the back line and marks 45 out, his kick is good and the Giants have their first major since the opening term. BEHIND DEMONSMelbourne have the ball deep in attack, it falls to Blease who has a high looping shot...off line for a behind. GOAL DEMONSSellar marks a horrible mongrel punt, he was the quickest to react and dove into path of the rapidly falling ball. From 30 metres out Sellar kicks the goal. The final term is underway and once again the GWS is straight into attack, all day their rucks have worked tirelessly however there work has been largely unrewarded. The siren sounds and the Melbourne coach rushes onto the field to try and instil some life into his charges. GWS score that term was limited to a solitary rushed behind. 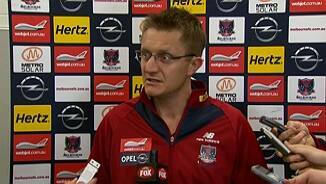 Mark Neeld will not be happy, this has been a lack lustre performance by Melbourne, they should be putting the Giants to the sword but instead both sides are playing error ridden football. 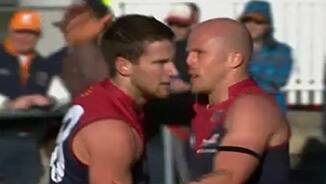 BEHIND DEMONSAnother minor score to Melbourne as they continue to pepper away at the goals. BEHIND GIANTSGWS finally add to their score, with a rushed behind. GOAL DEMONSSellar with the ball runs through 30, he draws the player and then sends a poor hand pass into the square, Rivers is however up for he task and soccers the ball out of the air, goal. BEHIND DEMONSHowe pulls down another big mark and once again lets the Giants off the hook as from point-blank he pushes it wide. SUBSTITUTION MELBOURNETom Couch comes off making way for Jack Watts. BEHIND DEMONSGreene running into sprays the kick wide for a behind, that was a let off for GWS. GOAL DEMONSBall up just outside of the Dees attacking goal square, from the stoppage the ball is trickled out to Howe who screws the kick around his body for a goal. Davis had the ball on the wing for the GWS and looked down field for someone to kick it to, there was noone there, their forward line was completely empty. Both sides have the ball trapped in the centre of the ground and the game has almost ground to a halt as they play kick to kick between opposing 50 metre arcs. Taylor Adams with a shot on goal, he totally misreads the wind and sends the ball hurtling out on the full, free kick Melbourne. GOAL DEMONSHowe flew for the mark and missed, however he was payed the free kick as Davis took him high on his followthrough. Howe's kick is horrible to look, at but limps through for a goal. The second half is underway in Canberra and the Giants were first into attack. Melbourne stamped their authority on the match as they snuffed out an early challenge by the GWS before dominating the latter half of the term to go to the main break with a three goal lead. The siren has sounded but Edwards will still have a chance to score, his kick from 45 out is long and high into the wind, but falls well short, half time. BEHIND DEMONSTapscott marks and then once again has troubles with the breeze to add another behind to Melbourne's score. The Giants just cannot get the ball forward, they're getting the ball out of defence but a haemorrhaging through the centre. 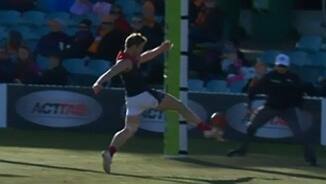 BEHIND DEMONSBoth sides are having trouble kicking for goal, another shot goes wide as Melbourne creeps ahead. BEHIND GIANTSSmith with a long shot on goal, sees the ball go wide, with the wind and through for behind. GOAL DEMONSTrengove marks at centre half forward, the Umpire calls play on and then changes his mind! Take two...Trengove from the set shot slams the ball home, goal Melbourne. BEHIND DEMONSHowe with his third shot on goal in the space of three minutes, this one courtesy of a relayed free kick. From 45 out he puts it through for another point, the wind is bothering him. 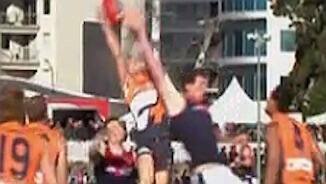 BEHIND DEMONSHowe with another mark, he is starting to become a problem for the Giants. Howes' kick is poor it was wide rom the second it left his boot...one behind. GOAL DEMONSA poor kick across the face of goal sees Howe gifted the ball 30 out right in front, Howe cannot believe his luck and kicks the goal. 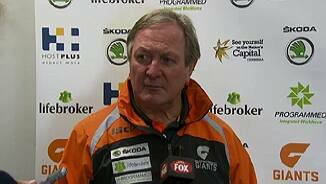 That was poor, poor football from the GWS. BEHIND GIANTSPhillips marks 50 out and decides to have a shot into the wind from the flank not favoured by the breeze...his kick wasn't too bad, it was a near miss and sails through for a behind. BEHIND DEMONSThe Giants are under a mountain of pressure pinned in the Demons' goal square, they work hard and finally force it through for a rushed behind. GOAL GIANTSFormer Demon James Macdonald gathers 30 out, he draws the man and then lay the ball off the Toby Greene who cruises into goal and scores. Back to back GWS goals. GOAL GIANTSScully drifts across the pack and marks 45 out, his kick is ugly, ugly, ugly but it wobbles and bobbles its way through the air and between the big sticks...goal. GOAL DEMONSRivers is loitering behind the pack the ball comes off hands and falls to him, not one to look a gift horse in the mouth he turns and goals. The second term is underway and almost immediately a pack develops, finally the Umpire plucks a kick out of thin air and Frawley comes up with the kick. At the first change the Dees lead by 8 points, the game hasn't reached any great heights however Melbourne's bigger bodies are starting to take their toll on the battle weary GWS youngsters. Dunne leaps high as the seconds down to finish the first term, he can't drag the ball down and as players scramble to gather possession the siren sounds. BEHIND DEMONSBail is tucked tight in the forward pocket, with the wind whipping across the ground this is going to be a tough kick...the ball held its line until the last moment, one behind. Jones is ridden into the ground and awarded the free kick however on the way up he slams his opponent's head into the turf and has the kick reversed. GOAL DEMONSMelbourne with back to back goals as Green marks 40 out and this time using the wind to his advantage goals. GOAL DEMONSScully is called for high fend-off on Trengove, he takes out the mouth guard and lets the Umpire have a serve...50 metre penalty. Trengove kicks his first. BEHIND DEMONSGreene has to throw himself prostrate to take a diving mark, however his kick from 45 out is off line, he didn't factor in the strong breeze which dragged the ball across the face. GOAL GIANTSA por pass from Spencer is intercepted by Greene who sends a kick deep into the goal square...Edwards climbs up over the pack and pulls down a great mark, he goes back and goals. The Giants have the ball deep in attack, when they go forward their press is working a treat against a hesitant Melbourne defence. GOAL GIANTSThe boys from Western Sydney go coast to coast from the kick in and Hoskin-Elliot doesn't let them down as he pulls in a strong mark. And just like that Hoskin-Elliot has his first. BEHIND DEMONSJones with the ball crosses the arc and sets sail for home...the ball stats wide and finishes wider, creeping in for a behind. BEHIND GIANTSFrawley with an easy turnover gifts the ball to Green who at pace tries to kick the Giants' first. 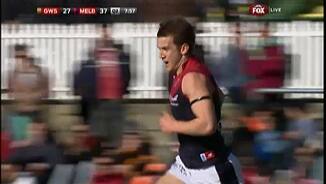 His kick lets off the Demons' veteran as it just sneaks in for a minor score. 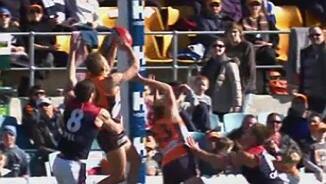 BEHIND DEMONSBuntine with a crucial smother denies Green the goal and then whacks it through for the rushed behind. GOAL DEMONSHowe on the tear cuts through centre half forward, he draws the defence to him before loping a long left handed hand pass to Sellar who lopes into the open goal. BEHIND GIANTSStrauss is forced to rush the behind and conceded the first score of the match after Hoskin-Elliot spills the mark just outside the GWS' goal square. The ball is bounced and Scully is quickly into action as he lays a hard tackle and is awarded the free kick off of the wing. Luke Power leads the Giants through the banner as, surrounded by his family, he celebrates his 300th AFL game. The Subs for both sides are Clifton for the GWS and Watts for Melbourne. Welcome to a sunny but cold Manuka Oval in Canberra for the clash between Melbourne and Greater Western Sydney, both sides would dearly love a win but the Dees really need this one!